With its external steel structure a deep blue; its poloidal field coils bright red and its waveguides sparkling yellow, Tore Supra (now WEST) has always been an exceptionally colourful tokamak. More than a year after producing its first plasma, the ITER-relevant WEST project was inaugurated amid a spectacular light show. Last Friday, as WEST was being inaugurated, a spectacular light show added to its already rich palette. 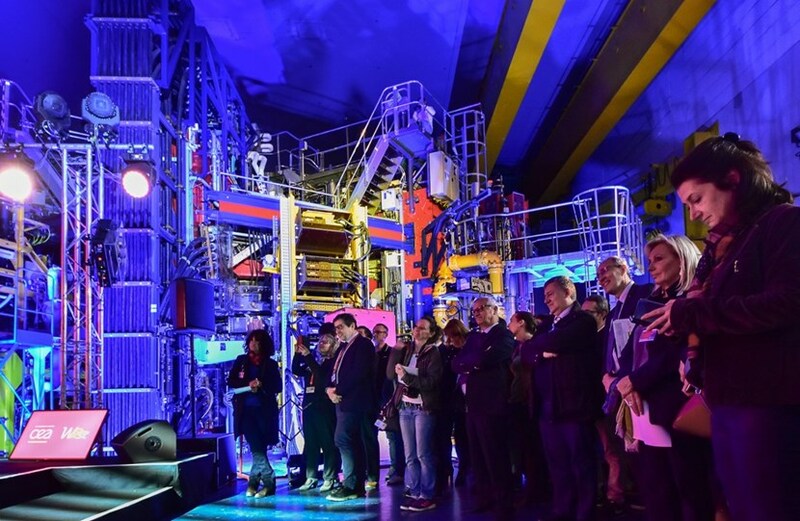 Although it has been more than a year since it produced a first plasma, the rejuvenated, ITER-relevant machine officially came into the world last week. Two French Parliament members, several representatives of the local governments that contribute to the project's funding, and representatives of the Administrator-General of the French Alternative Energies and Atomic Energy Commission (CEA) hailed the "beautiful collective adventure" that has led to WEST's realization. "Acting as a test-bed for ITER , WEST will mitigate the risks associated with an all-metal divertor," explained Alain Bécoulet, the head of CEA's fusion department. Located at CEA Cadarache, a stone's throw away from ITER, the WEST project was launched in 2008 at a time when Bernard Bigot, the present ITER Director-General, headed CEA. In-kind procurements from China, Korea, Japan, India and Europe contribute to more than a third of WEST's EUR 24 million budget.